Register for the Boulder County Bike Listserv to learn about bike-related items from the county like road closures and travel restrictions and bike events. Cyclist-Motorist Community Working Group works to make travel safe in Boulder County for both modes. 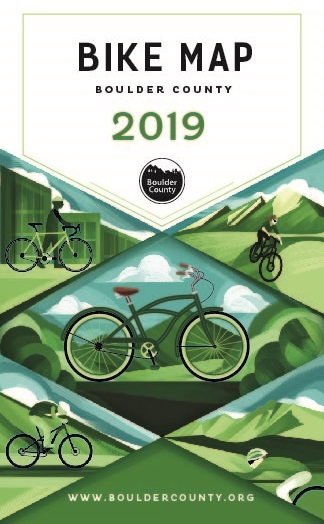 The Transportation Department implements Boulder County’s Bicycle Program with the goal of enabling safe and efficient bicycle travel throughout the county, recognizing that cycling is an activity enjoyed by people of different ages and ability levels. Boulder County Parks & Open Space (POS) provides numerous trails for recreational cycling. Visit POS trails website for a list and maps. Check out the City of Boulder’s bike maps. Request bike maps for you or your company by contacting Alexandra Phillips. Bike-n-Ride Shelters provide long-term, secure and weather-protected bicycle storage for commuters making connections to and from local or regional transit routes. Combine a bus trip and bike ride by using the shelter to complete the first or final mile of your commute! Helping to make travel by bicycle easier and safer by sweeping shoulders on the most well-traveled bikeways, conducting snow removal on shared use paths, and conducting other maintenance activities on bicycle facilities. Counting the number of bicycle riders on different roadways and shared use paths to determine which routes are used the most by cyclists. Check out the Safe Cycling on Boulder County Canyon Roads website to learn about how you can safely navigate through the mountains. Supporting “Safe Routes to School” and other community initiatives to encourage bicycling and other healthy activities that begin early in life. Working with groups throughout the county including Boulder County residents, state and local agencies, and bicycle organizations to promote cycling and to identify funding opportunities. Colorado’s Bike to Work Day is the 4th Wednesday in June every year. Subscribe to the county’s bike email listserv to receive timely updates about cycling around Boulder County, including roadway closures and other restrictions.